Imbolc, also known as February Eve, is a time of honoring the fertility of the land underneath the cold snow and ice winter brings. It is the first signs of spring, the first ray of light after the long winter. We celebrate it with bonfires and candles, early spring flowers and root vegetables, with laughter and hope of the growth to come. Last year, while thinking about a sabbat altar series, I contemplated doing a limited budget series. My survey at the end of 2018 confirmed it: Readers want to know how to create altars for the sabbats on a budget. In the process of contemplating low-cost altars, I came up with an idea: To shop at either a thrift store or a dollar store for my items. Here are the rules! Altar items must be obtained at either a dollar store or a thrift store. Items must be purchased in a single trip to one location. Items can cost no more than a $20 bill - preferably less. Only items purchased in the trip can be displayed on the altar - nothing owned prior, nothing from the herb cabinet, nothing found outside, etc. Must provide proof of purchase (and thus cost). 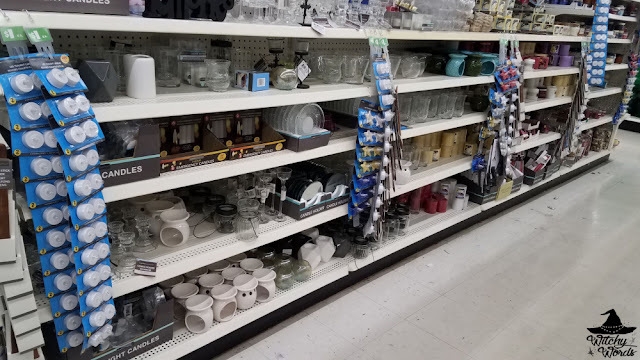 For my first thrifty altar, I decided to keep it simple and go with a dollar store that has more than 14,000 locations in the US and Canada - meaning you're likely to be able to find the same things I purchase here at your local location. 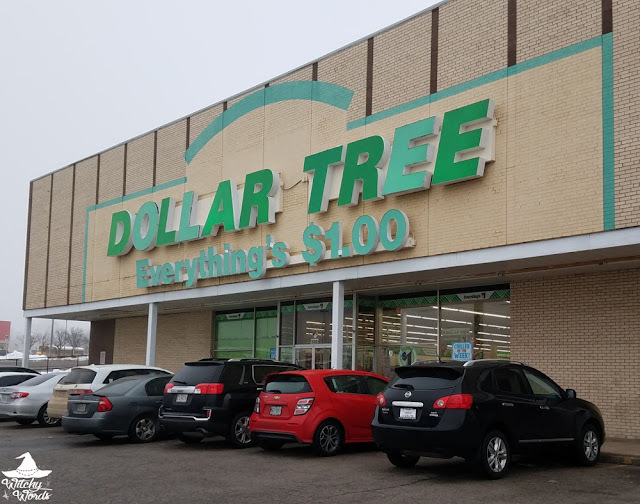 I needed to pick up some supplies for my February Eve craft anyway, so this made it a simple stop. If you don't mind having faux representation on your altar, most dollar stores will have rows upon rows of cheap, accessible fake flowers in a variety of colors. 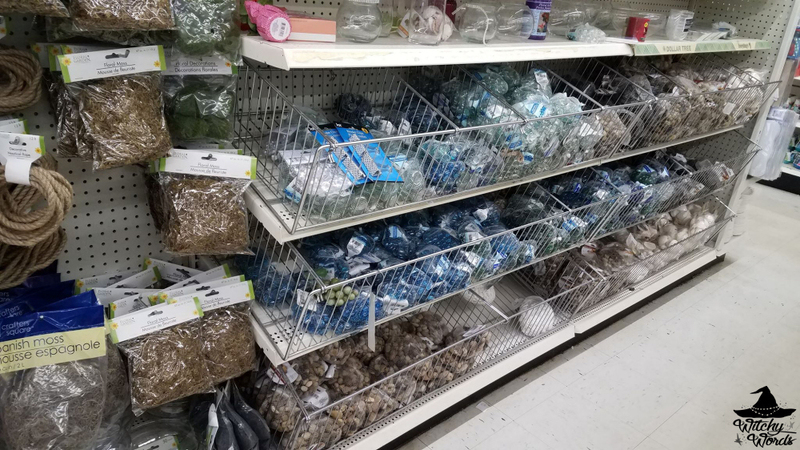 The floral section may also have plenty of rocks, marbles, glass stones, moss, rope, vases and more. They should also have a pretty hefty selection of candles, candle holders, wax burners and incense. They'll even have a plethora of LED candles if you can't have an open flame! And I spent just $11.86 USD! The cashier admittedly double-rang a few things and replaced them with others. 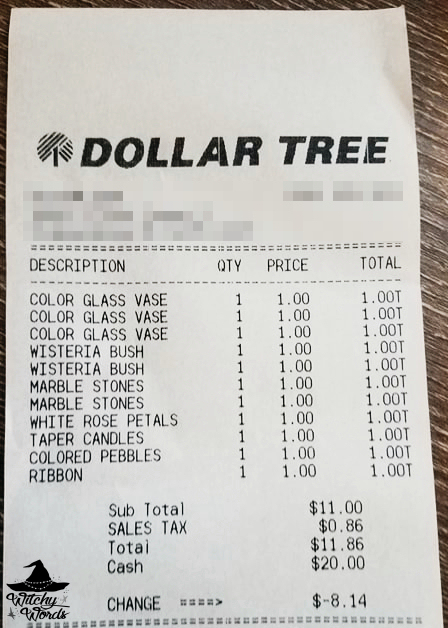 For example, I obviously didn't get three color glass vases, two wisteria bushes or two marble stones. I do think I might have one item unaccounted for, but I'm not certain. Either way, I'm counting this as $11.86 because that's what I spent! For this altar, I stuck with white, green, and clear glass. White is a cleansing, healing color often associated with snow. Clear glass often represents ice to me. And green, a color of growth and prosperity, can represent the budding plants popping up through the hardened soil. By limiting my colors, I found I had an easier time deciding on the items I needed to complete my altar. This single candle shining brightly in the dark reminds me of Imbolc: That spark of light and warmth in the cold. The days are just now noticeably longer, the warm just returning. That single candle is a perfect representation of that. From the wisteria bush, colored vases and white stones, I created this display on either side of the candle. Wisteria is known for symbolizing longevity, endurance and victory over hardships. These traits are particularly noticeable at this time. The trees continue to live through the frigid cold. The plants are trying to return through the snow-covered ground. Greenery is paired with ice on Imbolc, a true testiment to victory over hardship. I also placed the white stones in these cups, tying a green ribbon around the stem. The white stones had a sparkle to them that reminded me of snow. 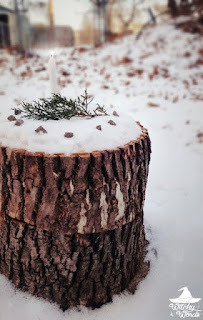 I wanted these stemmed candle holders to almost represent the reverse of what's happening: The snow rising from the plants, rather than the plants rising from the snow. I felt they made a complimentary pair to the wisteria vases. Finally, in the center, I created this display. I felt as though the altar surface, a mirror, could represent clear, crisp water freshly melted from snow. The white flower petals represent the frost, the patterns that ice makes on water. 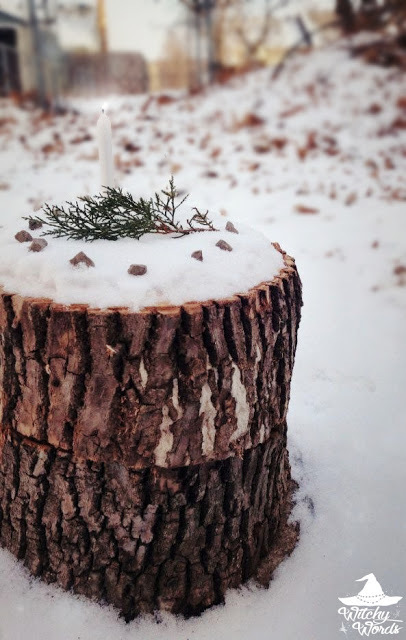 The glass candle holder represents ice, a layer of which we often have here in Kansas City under the snow, which is represented by the white stones piled in a mound on top. Finally, I took some leaves from the wisteria bush and sat it right in the middle on top - an obvious ode to the plants growing through the snow. Overall, this altar perfectly represents what I picture February Eve to be and it cost me just under $12 to create in a single trip to Dollar Tree. 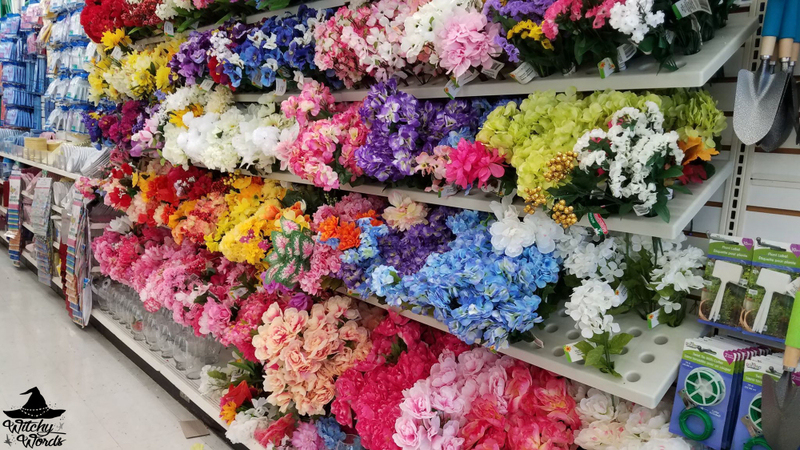 I hope you find some inspiration in this post to create your very own inexpensive altar with simple items from your local dollar store! I'll leave you with a visual diagram of this altar. Enjoy! This is so gorgeous! I'm wondering how many days before each sabbat you usually put up your altar for that sabbat, and how many days you leave it up afterward before you start on the next sabbat's altar?